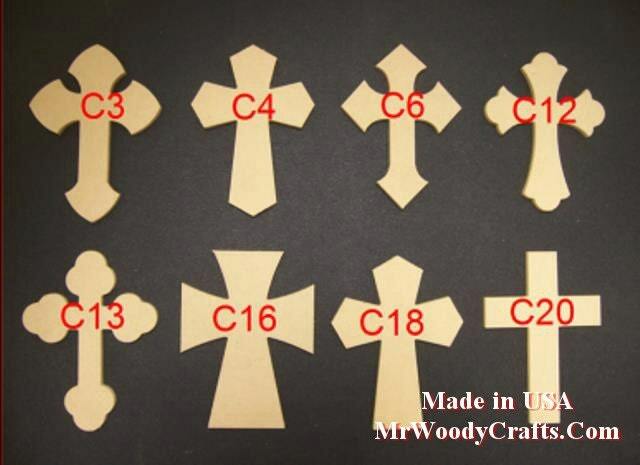 You are buying 25 9" x 12" Unpainted Wooden Crosses, cut from 1/4" MDF Anything under 1/2'' thick will not have a keyhole. All of our items are cut from Plum Creek MDF consisting of 80% recycled materials. These crosses are great for church projects, home projects, home decor, gifts, Mosaic bases and Sorority projects. Our items paint very well to suit your decorative ideas, but they do not stain well. May require light hand sanding. 1/2" thick have a key hole on the back for wall hanging, 1/4" thick do not. WHEN WILL MY ORDER SHIP ? Order will ship less than 5 days after payment is made. You are buying 25 crosses, please pick 25 from the above pictures, you can pick all the same or mix and match, please list these 25 cross numbers in the buyer notes at check out. If you are using a discount code please enter it at check out, there is no way of going back after check out. Limit one discount code per order. WHAT SHIPPING METHOD DO YOU USE ? We ship UPS ground and USPS, depends on the weight of the order, most orders under 10 lb. will ship with USPS. You will receive a tracking number when your order has shipped. DO YOU OFFER DISCOUNT CODES ? If it was damaged in shipping or we shipped the wrong item, we will replace the item for free. If you want to return or exchange an item it may be subject to a 20% return / exchange fee. DO YOU COMBINE ITEMS TO SAVE SHIPPING COST ? DO YOU HAVE A ON LINE STORE ? USA, We strongly believe in the good old USA and we strive for exceptional quality in our products. Our employees are dedicated to producing outstanding wood products. The equipment used in this process is made in Texas USA. The wood used is cabinet grade material made in the USA. All products are made and shipped from Lewisville, Texas USA. Thank you for reading our Q and A section. Hope it answered your questions and please use discount code IHAVEREADEDQANDA for 10% off on this order of $20.00 or more. Love it..... arrived quickly and expertly made!